We are trying to eat whole foods as much as possible. My son is a year old, when is it okay to give him fruits and vegetables with the peel? Why not now? Without the peel those vegetables and fruits aren’t whole foods anymore, are they? The only reason to avoid eating peels is the presence of pesticide which unfortunately is very prevalent. As far as possible, get fruits and vegetables grown without toxic pesticides and fertilizers. Better yet, grow them yourself. There is growing awareness of low-input sustainable farming as well as kitchen-gardening and terrace-gardening and you should probably be able to find a support group or farmer’s market near you. If not, comment below and we will try to connect you. 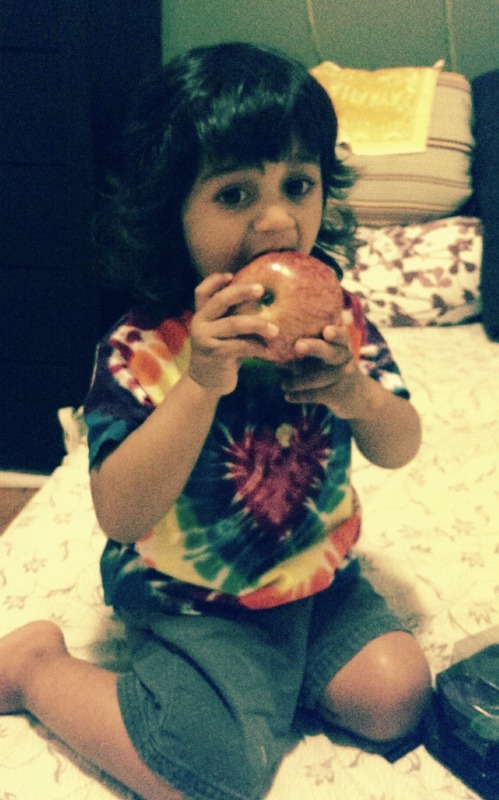 Riyaan takes a bite out of an apple. As with any food, remember that you don’t need to persuade children to eat. In fact, when I visited some friends recently and saw their one-and-a-half-year-old son walking around the house chomping away at a big apple, I asked his mother when he started picking up apples and eating them whole. She could not remember. “I actually did not even know he had picked that up,” she remarked. Some people advise peeling fruits and vegetables before making puree for babies but actually you do not need to puree fruits and vegetables. You can if you want, but if the baby is not old enough to chew the food, probably he is better off waiting till he is. Breastfeeding supplies all required nutrients in a more easily absorbed format so the real purpose of eating in late infancy is to get practice in chewing, eating, holding food and transporting it to the mouth. Babies don’t get to practice any of these skills if you puree the food and spoon it into their mouths for them. Especially if they are engaged with toys or videos while you do this. One of the reasons it is important to eat the peel with fruits, vegetables and legumes, and to eat whole grains, is that the fiber and carbohydrates in any food are better utilized by the body when they are together. When people eat a low-fiber diet and then take fiber supplements, they get less benefit from the fiber than if they consumed the fiber as part of the whole food that it came in. The difference between fruit and fruit juice, after all, is the fiber. The juice may have “no added sugar” but if it has “removed fiber” then what results is NOT a whole food and certainly not as good as eating the fruit. Similarly you may be munching away on a lovely salad, but if you have peeled all of the vegetables then you have lost important nutrients and fiber. While the industry likes people to believe that all they need to add up is their total daily grams of carbohydrates, the way you get them also matters, and we metabolize sugar differently when we eat it as part of a whole food. “Eat regular fruits and vegetables” seems almost too obvious to write, but the skyrocketing growth of fiber supplements and processed fruit products such as “Tropolis” on which I defer for comment to the inimitable Stephen Colbert. See just before the one minute mark. Next Has your baby doubled her birth weight?